On our last RV outing, we found ourselves in the middle of a small group of rather unique RVs. We saw lots of homemade RVs constructed from old buses. Though some were modest in design, others were a bit over the top, and yet others were as well laid out and well constructed as any professionally built rig on the road. My interest in self-built motorhomes began when I was a teenager. 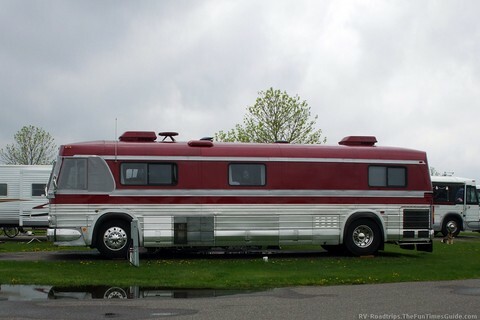 My father converted a 1955 Ford school bus into a motorhome for our family of 7. He was a cabinet maker by trade, which provided the skills necessary to create a woodworking masterpiece. His bus motorhome conversion was done entirely in black walnut. The interior was phenomenal! 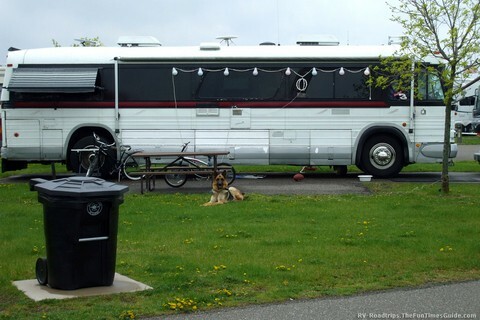 Converting a bus into an RV is a challenging project — whether you’re starting with a retired Greyhound coach or a school bus that’s been turned out to pasture. 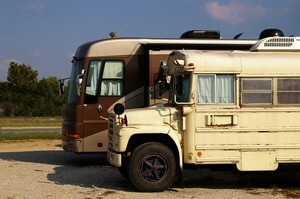 Both can make excellent RVs, though generally the finished product will dictate the type of RVing you’ll be able to do. So, you will want to choose your bus accordingly. Greyhound buses require blacktop roads. They quickly become helpless when faced with country back roads which are rarely maintained. So it might be more difficult to get to your favorite fishing hole in a Greyhound RV bus conversion. On the other hand, school buses are just about indestructible. Heading down rough trails is what they did for years to pick up children living in rural neighborhoods and deliver them to school. While a converted school bus can be just as elaborate and well done as any coach on the road, they’re still classified as less than desirable by some RV campgrounds. Many of the larger RV resorts prefer a more standard style of RV. As a result, those who pull up in converted school buses are often turned away. A converted Greyhound bus, on the other hand, provides a comfortable ride with soft suspension, along with the added quietness that comes with having a rear engine. Since the appearance of a Greyhound bus conversion more closely matches today’s luxury coaches, they are much more readily accepted just about anywhere they go. Building an RV based on any type of bus is an expensive enough project that serious thought should be devoted to choosing your base vehicle. The best advice would be to purchase the very best bus you can possibly afford. School buses can be found for as little as $1,000. However, be warned. You may find these low-cost vehicles seriously corroded or badly in need of a mechanical overhaul. Both are expensive problems that may sideline your project before it even gets started. The same goes for highway coaches. Cheap is not always the best option. Your best bet is to find a bus with an available maintenance history. You want to have proof that such things as brakes, transmissions, etc. have been serviced or replaced recently. This will help greatly in your decision-making process. The reason? Breakdowns will be very expensive. The corner gas station wrecker can’t help you. A heavy haul specialist will have to come and rescue you when you’re stalled along the road. The cost for this can be in the very high hundreds of dollars for even a minor problem that requires towing. Even changing a flat tire is beyond the capabilities of most individuals. When you start shopping for a bus, forget about local sources. Now’s the time to do some serious research on the Internet. There a number of locations nationwide that sell used school buses. There are also companies that specialize in used motorcoaches specifically with the purpose of converting them into RVs. The only thing similar between the 2 is the word “bus: and the fact that they were constructed to transport people. Structurally and mechanically speaking, they are 2 completely different animals. Building your own coach from a bus can be a very satisfying and rewarding experience. When it’s done, no one will know better than you how it’s put together. This also makes repairs easier, if you’re a do-it-yourselfer. Choose wisely between a school bus platform and a highway coach platform. They both have good and bad points. Buy the newest, best-maintained bus you can find within your budget. Maintenance records are like the Bible for your RV bus conversion. The more you know about the bus you’re starting with, the easier your decision will be. Take lots of time planning a layout that will best suit your needs. Do the highest quality of workmanship you can. Your RV bus conversion will be a sizable investment that, at some point in time, will be sold. The higher the quality, the better the return. 6 to 8 miles per gallon. Check with your local authorities first. Buses under construction in the backyard are something that many urban areas will not tolerate. Check your local ordinances. Buying the bus is only a small part of the expense for your project. 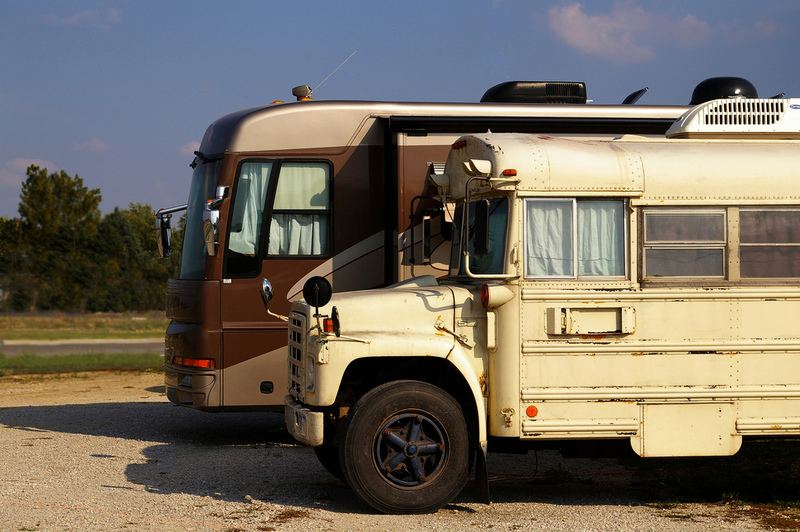 A good RV bus conversion can cost as much as a late model Class A motorhome.